Luckily, anyone suffering from these afflictions has reason to hope. Stunning breakthroughs in neuroscience show that our brains are more malleable than we ever imagined. 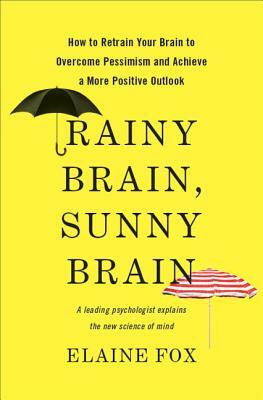 In Rainy Brain, Sunny Brain, Fox describes a range of techniques—from traditional cognitive behavioral therapy to innovative cognitive-retraining exercises—that can actually alter our brains’ circuitry, strengthening specific thought processes by exercising the neural systems that control them. The implications are enormous: lifelong pessimists can train themselves to think positively and find happiness, while pleasure-seekers inclined toward risky or destructive behavior can take control of their lives. Drawing on her own cutting-edge research, Fox shows how we can retrain our brains to brighten our lives and learn to flourish. With keen insights into how genes, life experiences and cognitive processes interleave together to make us who we are, Rainy Brain, SunnyBrain revolutionizes our basic concept of individuality. We learn that we can influence our own personalities, and that our lives are only as “sunny” or as “rainy” as we allow them to be. Elaine Fox is currently a Fellow of Magdalen College, Oxford and Director of the Affective Neuroscience Laboratory in the Department of Psychology at the University of Essex, where she leads a program of research combining cognitive psychology, neuroimaging, and genetics. She has been Head of the Department of Psychology at the University of Essex and an associate editor of leading scientific journals including Emotion/i> and Cognition & Emotion. Her work has been discussed in Nature, Science, New Scientist, The Economist, and the New York Times. A Fellow of the Association of Psychological Science (APS), she divides her time between Wivenhoe and Oxford in England.